There is simply no Hawaiian welcome that beats a Lahaina Yacht Club Vic-Maui greeting party, unless it's three LYC greeting parties at the same time! Now that we all survived this morning's party-fest, which stretched on well into the afternoon, it's back to the armchair to produce this final edition (for the 2018 Vic-Maui) of The Weather Eye. The normal summer weather pattern, dominated by the North Pacific High and the Trade Winds, is now in full effect over the Vic-Maui course (ignoring lighter conditions far to the east near the California coast). This return to normal weather has been very helpful to the Vic-Maui fleet as the boats have had a romping Trade Winds sail towards Maui over the past four-plus days, racking up big 24 hour runs in breezy conditions. Wind speeds have mostly been at the higher end of the predicted speeds, in the 20 knot range, and higher in gusts and squalls. This year's approach to the Pailolo Channel has been from farther to the West than is usual, for reasons that were discussed in earlier "The Weather Eye" articles. The combination of a more Westerly approach and normal Trade Winds has caused the True Wind Angle (TWA) for the final approach to be hotter than usual, with numbers in the 80-110 degree range. This has meant that the boats have been sailing at reaching angles, rather than at or near their downwind optimum running angles. The combination of reaching angles and sporty trade winds has rewarded boats that had a viable sail inventory for those conditions. The first five boats have all finished without too much drama in the Pailolo Channel itself. The wind generally bends into the channel, and often accelerates too. 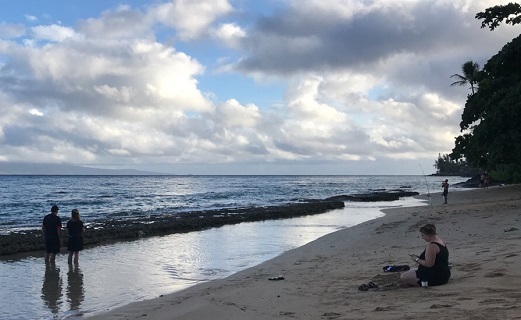 Boats that get too close to the Maui shoreline can end up in the lee of the island and experience very puffy and/or lighter conditions, compared to boats that stay nearer the middle of the channel. Boats often set up to approach the finish line from somewhere out in mid-channel, hardening up to a tighter angle to pass inside the seaward end of the line. Having a spinnaker up, and a jib or reacher plugged in and ready for immediate hoist, is common practice. Delivery skippers are already arriving in Maui and preparing for the return voyages to home ports. They will definitely be looking at the weather to pick their departure times and sailing plans.